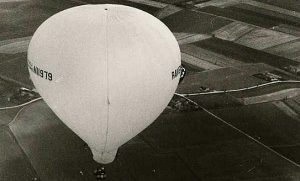 On April 13, 1963, just 3 years after inventing the modern hot air balloon, Ed Yost, accomopanied by Don Piccard flew this modern hot air balloon, dubbed “The Channel Camp” across the Englilsh Channel. They started in Rye, England and landed in Gravelines, France after a flight of 3 hours and 17 minutes. They had to go to an altitude of 13,500 feet to get winds to take them in the right direction. 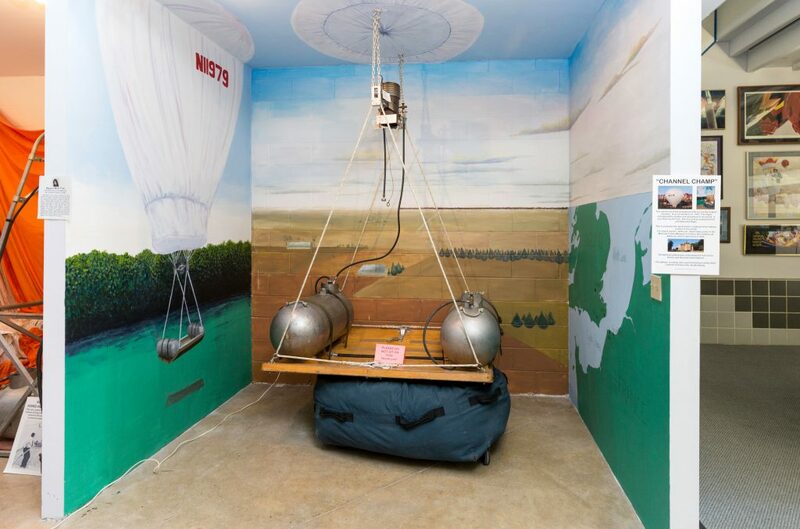 Their gondola or basket consisted of this stone board with propane tanks attached. This exhibit opened in 2006. Ed Yost, pilot of the flight, and inventor of the modern hot air balloon was present and talked with the people about this historic flight. A short movie with actual footage of the flight photographed, prepared and narrated by Don Piccard, and a short PowerPoint Slide show about the flight made by Museum Board Member, Dennis Nicholson, were shown in the museum theater. A program of recognition was held at 2:00 p.m. Gary Ruble, President of the National Balloon Museum Board of Directors introduced Orvin Olivier, Balloon Federation of America Board Member, and chair of the BFA Awards Committee who in turn introduced Ed Yost and Russ Pohl. Pohl was a crew member for the flight and Senior Physicist for Raven Industries.